Real Thai flavor can’t be found in a jar, said Kris Yenbamroong in Night + Market (Clarkson Potter). That’s why at Night + Market, my L.A. restaurant, we make our own chile powder and all the other building blocks of our most popular dishes. In the dish below, the curry paste requires the most effort. But it’s “beautiful when done right: earthy, smoky, fragrant, and surprisingly lacking in heat.” Plus, the leftover paste will keep for weeks if refrigerated. For roasted chile powder: In a dry wok, evenly roast 2 cups dried Thai bird’s-eye chiles over medium heat until dark crimson (about 10 minutes). Remove chiles and let cool. Reserve ½ cup to make chile oil. Place remainder in a food processor and grind to the consistency of red pepper flakes. For chile oil: Combine reserved chiles, ¼ cup oil, and 1 pinch kosher salt; blend until chiles break down into coarse shards. Tweak salt and oil-to-chile ratio to taste. When done right, the broth is slurpable. In a dry wok over medium heat, toast chiles, turmeric, garlic, ginger, and shallots separately, until blackened and slightly soft, 5 to 10 minutes each. Add to food processor with remaining ingredients; blend to a paste. In a large pot, combine steak, salt, fish sauce, and coconut sugar and milk. Bring to simmer over medium heat; cook 20 minutes. Skim any beef scum from top. 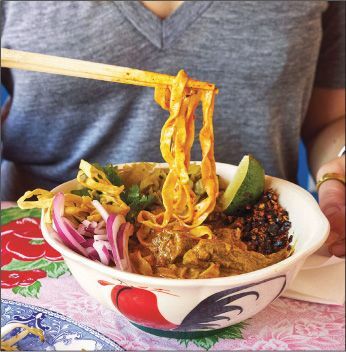 Stir in khao soi paste, turmeric, and curry powder; simmer until meat is tender, 40–60 minutes. Thin curry with about 1¼ cups water, until slightly thicker than a chowder. Bring to boil, then remove from heat. Boil noodles until just cooked; drain and cool. Portion cooled noodles into four bowls; ladle on meat and curry broth. Top with chow mein noodles and next four ingredients. Drizzle on chile oil; garnish each bowl with a lime wedge. Serves 4.